Home > Headlines > News > Does Volvo Have a Hybrid Model? See the XC90! Does Volvo Have a Hybrid Model? See the XC90! Your vehicle is an investment that should pay off for you now and in the future. Hybrid vehicles deliver new technology, efficiency, and a more sustainable drive, without sacrificing power. Looking for a hybrid model that is eco-friendly, without compromising on aesthetics and performance? Enter Volvo's XC90. Visit your Toronto Volvo dealership at Volvo Metro West to take a closer look at this model. Read below to find out more about what this SUV has to offer. Driving Modes to Keep You in Control: If you like more choice, you'll love the XC90. There are five driving modes so you can find the perfect level of control for each route you take and your particular driving style. Choose from Dynamic Mode for full performance, AWD Mode for all-wheel drive when you need it, or Individual Mode to mix-and-match and customize the perfect mode for your drive. Engine Options to Keep You Moving: Whether you crave power or prioritize efficiency, the XC90 has options to satisfy your needs. The Twin Engine boasts three different modes, so your vehicle can do both—suit your mood and handle whatever the road throws its way. If you are looking to skip filling up at the pump, use the pure mode for your daily commute. You can get a complete charge in as little as four hours and reach speeds of 120 km/h, getting you to work and home again with minimal emissions. The hybrid mode can be used to give you the best of both worlds, engaging the powerful gas engine and the clean electric power. If you are facing poor road conditions or just need a little extra zest, drive in power mode and enjoy the driving and handling of a traditional fuel-powered vehicle. Luxury and Design: What makes the XC90 drive may be different, but what drives the team at Volvo hasn't changed! The same design principles and dedication to quality have been put into each element, finish, and part of this vehicle. Appreciate the understated, functional and stunning features you would expect from an SUV designed in Sweden. The crowning jewel of this ride? The stick made from Orrefors® crystal glass feels great in your hand and looks amazing by your side. The aim to make each vehicle an experience to own can be felt from the moment you test drive this hybrid. Space: Hybrid vehicles aren't only small rides for individuals anymore. You don't have to choose between efficiency and space. Enjoy room for up to 7 passengers in the XC90. If you need the flexibility to pack up your ride, you'll also be able to take advantage of 85.7 cubic feet of cargo space. Our Volvo dealer team in Toronto can answer all your questions, whether it's your first hybrid car or you have already owned and loved a hybrid vehicle. With impressive specs and the flexibility of power, storage, and aesthetics, you can feel good about finding a hybrid that meets all of your needs, and then exceeds them. Visit our showroom to chat with our knowledgeable staff today. 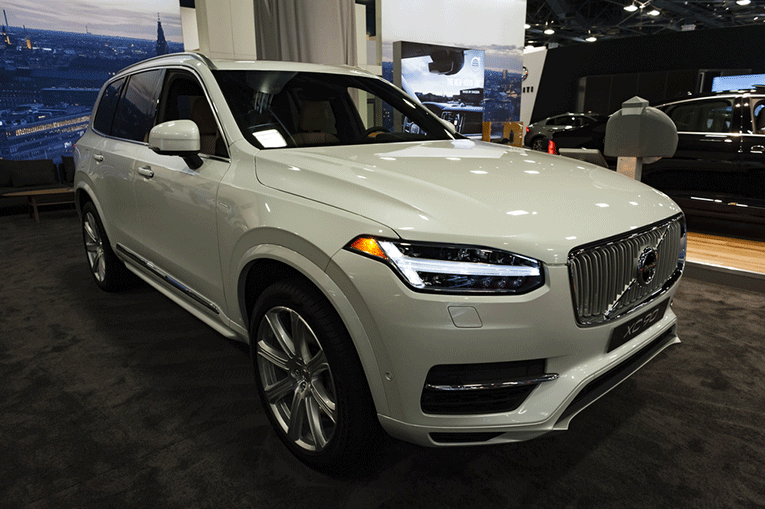 See the XC90 and our other models in person. From brand new to pre-owned vehicles and special offers, we have plenty of options to suit every budget and lifestyle. Visit Volvo Metro West to find the perfect hybrid vehicle. Contact us today to learn more about the XC90. Why Should I Service My Volvo at a Toronto Dealer?